The Ukraine’s recent political crisis, albeit significant, has detracted from an underlying problem which persists and is a large part of the reason for the conflict. The Ukraine acting president says the country will return to a path of European integration. This was the direction the Ukraine was headed before Valdimir Putin coaxed the former president Viktor Yanukovych to align the country’s economic interests with Russia instead of the EU. Mr. Putin has an exceedingly optimistic view for his country. He believes he is reforming the USSR under the auspices of a Russian-Easter European trade pact whereby currency, production and workers will have free exchange. The obstacle now for the Ukraine is primarily an economic one. Ukraine has a GDP growth rate of 0.0% and unemployment above 7.5%. The inflation rate is precipitously close to deflation at 0.5% falling well below ECB target of 4-6%. Deflation is a much more challenging problem to correct especially in heavily indebted countries because as the value of the currency goes down, loans, which are fixed in nominal terms become more expensive to service. This would be similar to paying your credit card bill with a fixed interest rate while the value of your salary decreases. It takes away from the money you spend on other things. Also, Russia will no longer provide the $13 billion bail-out it was prepared to in exchange for Ukraine participation in the Russian trade union, leaving the IMF and ECB to come to the rescue which they have made conditional on the establishment of a new government. 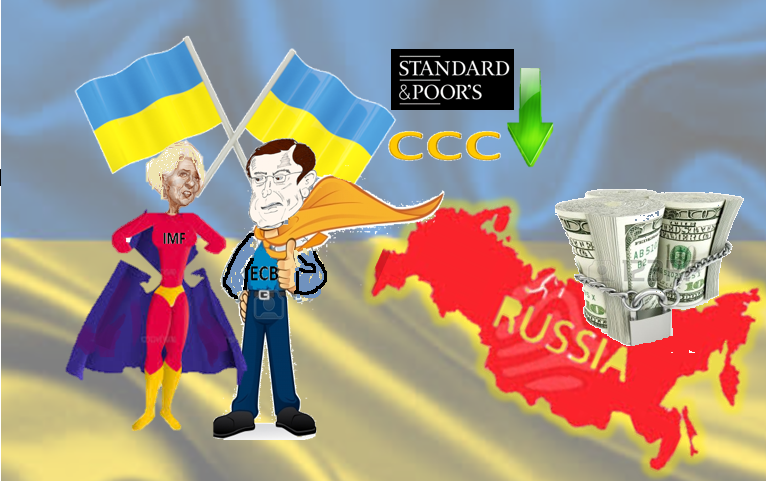 Further, S&P downgraded Ukraine debt to CCC, one notch above junk status, which means it will be more expensive for the country to borrow in the future. All this, in addition to the ongoing conflict and political turmoil, is likely to lead to a flight of capital (investors look to safer countries to invest in) while at the same time borrowing costs will go up.